We offer a multitude of Hawaii vacation rental home properties,for your vacation lodging. Requirements on Oahu from studios to five bedroom homes. Most of our Oahu vacation rental houses are located on the tranquil windward side on the island. All of our vacation rental properties are highly maintained and elegant throughout. 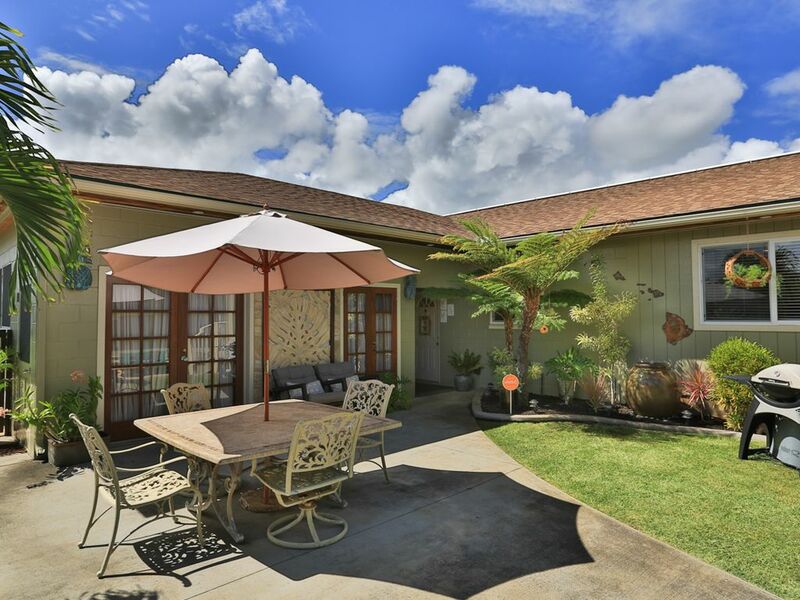 Makana's Place can be rented as a one (1),two(2) or three (3) bedroom home, in quaint Kailua Town. This Non-Smoking home is very spacious over 1500 square feet living quarters, which is equivalent to a 5 bedroom bedroom home. Beautifully decorated with well quality furniture. Makana's Place features a full kitchen along with a kitchenette plus an extra queen sofabed and single bed. Wonderful for children. The beach, yes the beach. It is about five minutes away. It has been rated the #1 beach in 'best beaches' survey. Most people come to Kailua for Kailua and Lanikai Beach. Makana's Place takes great pride in making sure your stay in Hawaii is everything you expect it to be - and more! We'll help make sure your visit to Oahu exceed your expectations. Central Air Conditioning in livingroom and kitchen. All other rooms have split system units. Whole house has Air conditioning. Many movies are aviailable, I can email over the list of movies to choose from for you to watch during your stay! Beautiful outdoor area with copper lighting to enjoy with a few cocktails and outdoor cooking with water feature. **Brand New Central Air Conditioning August, Wireless Internet Connection, Coffee Maker, 4 burner Stove Top, Can Opener, Pots, Pans, Dishes, Towels/Beach Towels, Alarm Clock, Treadmill, Fans, Picnic Table, Cooler, Beach Toys, Boogie Boards, Beach Chairs, Beach Mats, Umbrella, Fresh Flowers along with some special little extras from Makana's Place!, No Smoking indoors. Clean, well kept, well stocked, home away from home! This home was absolutely amazing! My family, friends and I enjoyed our stay at Makana’s Place. The home is so beautifullly kept and fully stocked with bath and beach towels including laundry soap and ingredients to cook with, it even had a rice cooker! Safe neighborhood and plenty of room outside to gather with the kids, friends and family for a small barbecue. The only thing I would say is that the trash and recycling bins need to be marked, because we had no idea which one was which and that there were multiple bins some of which belonged to the neighbor which we were not able to identify and separate, so we truly apologize if we put our trash and recycling in the wrong bins. Other than that, I would definitely recommend this home! Thank you Misty and Makana’s Place! You made our vacation a wonderful easy going stay! Thank you for your wonderful review. In response to this review we will be labeling the trash and recycle bins to no longer have this confusion. Mahalo, and hope we get to see you in the future. Makana's place was amazing. Everything we expected and then some. Beds were very comfortable slept like a baby. I would highly recommend staying there. We enjoyed are stay. House is confortable and clean. outdoor installation & bbq clean and practical. very good and polite service. We communicated with them for Dishwasher fonction and BBQ gastank. They answer promply for dishwasher and gastank was changed even before we came back from the beach. It was well appreciated. Thank you! I am so glad you enjoyed your stay. I hope we get to see you again in the future. We just got home from staying here for a week. We had a great time and really loved it! The house was a lot bigger than I expected. The bedrooms were really spacious the entire place was really clean. There were a lot of extra bedding and towels, which was nice! The garbage disposal starting leaking on us. We called the owners and Dean was there within an hour and it was replaced the next morning! I would definitely recommend staying here! Enjoyed my stay very clean and Misty answered my calls no matter the time! Thank you I will be booking here again. We had such a wonderful stay at Makana's Place. All rooms were very clean and full of amenities. My grand kids also loved the beach toys. Thank you so much for making our holidays the best ever.